Students may require a bit more help, especially where examinations are approaching and Mr Anthony Fok is willing to put in more effort to aid their revision. This is because he is committed to helping his students excel in economics and attain the results they want. Students may require extra help outside of lessons when they are doing self-revision. Mr Anthony Fok will be glad to entertain any questions in person after lessons – in fact, he will be more than happy to be able to help. They can also ask him questions over SMS and he tries his best to respond as soon as possible. This will be extremely helpful for those who require instant clarification or face an upcoming test before they attend the next tuition class. Students will be learning in an air-conditioned classroom, and can help themselves to the sweets placed on the tables whenever they find themselves sleepy or unable to concentrate. While no refunds are offered, students who are unable to attend a lesson due to various reasons are able to make arrangements to come for an alternative one within the same week. This is because we understand that students have busy schedules! If students find their school’s lecture notes difficult to understand and too thick, they will be glad to receive notes from JC Economics Education Centre. They are meant to speed up the revision process by being brief, succinct and yet comprehensive, great for quick revision sessions right before examinations or tests. Mr Anthony Fok will mark all students’ work so that he can check on their understanding. This includes both Case Studies and Essays, and they are not limited to the questions he goes through in lessons. Students who do extra practice can feel free to submit their answers for marking as well. Mr. Anthony Fok is the founder of JC Economics Education Centre, and is the only Economics tutor teaching all lessons.Mr Anthony Fok enjoys sharing his experience as a full time Economics tutor and has been prominently featured in print (The Straits’ Times, Lianhe WanBao, The New Paper, TODAY, Singapore Business Review amongst others) on television (Channel 5) and on radio (938Live). Mr Anthony Fok is zealous in Economics and Education. He graduated with a Bachelor of Accountancy (Honours) Nanyang Technological University (NTU), and a Masters of Education from Monash University, Australia. He also holds a Postgraduate Diploma in Education (PGDE) from National Institute of Education (NIE). He is currently pursuing his PhD in Education, specializing in Economics education, to constantly upgrade himself and develop greater proficiency in teaching. With his distinctive style of teaching, Mr Anthony Fok started JC Economics Education Centre in 2012. He tutors more than 200 students yearly who have benefitted tremendously from his coaching. He also used to teach in MOE schools before he became a full-time private tutor. Mr Anthony Fok distinguishes himself from other Economics tutors by catering to learners of various learning styles. He recognizes that each student has a different way of learning and faces unique problems. He thus makes use of a variety of teaching methods to help as many students learn as possible. However, he believes strongly that interest is crucial for students to succeed in a particular subject and the very first step towards attaining a good grade for it. He thus makes his lessons relevant and fascinating by including anecdotes and real world events. This allows Economics to come to life instead of remaining as a lifeless subject students mindlessly study, as if it is pure memory work. He also focuses on what’s most important for examinations, the skills and the concepts necessary so that revision is efficient but comprehensive. 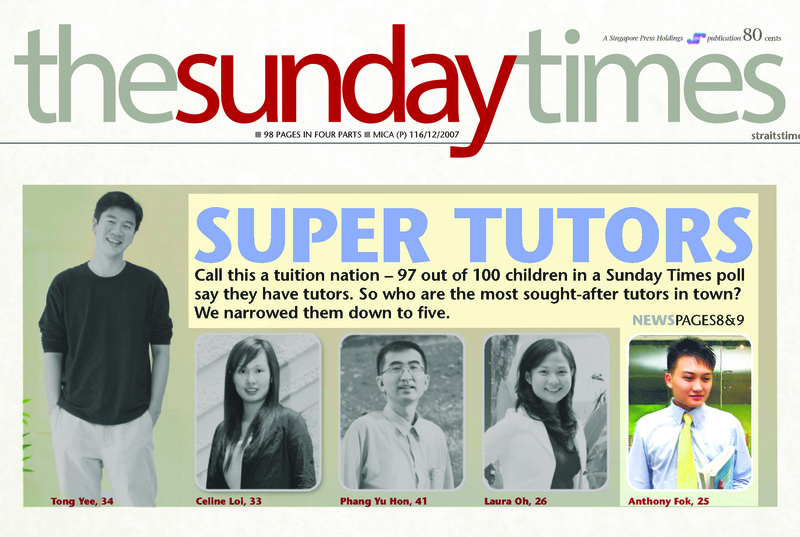 Mr Anthony Fok has found his calling in life as an Economics tutor, and he believes that passion is crucial for success. This is how he inspires his students, to love what they do and then do well in it. Mr Anthony Fok knows what is required to excel at the examinations. He will help bridge the gap between school’s teaching and the questions students face during tests. This speeds up the learning process, making Economics less painful and even enjoyable to study. Students busy with the demanding JC curriculum may find it difficult to keep up with all their subjects, including Economics. They may not be able to find the time to constantly keep up with the concepts, which is required as a strong foundation is the first and most crucial step to success.JC Economics Education Centre will try to strengthen student’s concepts during the lessons, repeating key concepts if necessary to ensure students are clear in their understanding. Constant contact with the syllabus through lessons will keep studentsfamiliar with their concepts, which will be at their fingertips when they need it.Students who attend lessons may have various aims, either to ask questions, to consolidate their understanding or go beyond the school’s curriculum – JC Economics Education Centre will be able to provide help to all students who want to improve their grade in one way or another. Now that the foundation is laid through proper and concrete understanding of economics concepts, the next step is to tackle questions. Students find it hard to bridge this gap, as they find it hard to put their economic theories to paper when they see questions. Moreover, theories are rarely symmetrical with reality and students are now expected to reconcile this divergence and seeming opposition. This may indeed be challenging and mind-boggling initially. But as students go through essays and case studies, they will learn how to see the contrast and understand the limitations of the real world, and why ceteris paribus does not hold. As they come into greater contact with questions that are similar to those that will be tested at the end of the day, they will gradually become adept at handling any question that comes their way. To reach for that penultimate grade, it is incredibly important for students to be well-versed in the Singaporean Economy. The A Level examinations often test Essay and Case Study questions that require students to be familiar with the workings of the local economy. Students must know the various economic aspects of Singapore, its defining features and the challenges it faces. Lessons thus offer students a window into understanding the Singapore economy, either when Mr Anthony Fok discussesrecent economic events and relates them to Singapore, or when he applies concepts to the local context. Of course, how the Singaporean economy operates can be well understood when students also learn about other economies. Afterall, economies are mutually interdependent, and thus getting in touch with and distinguishing between different economies will help students see the links and apply the concepts they learn. Students are introduced to not only the major ones, like China, USA and Japan, but will also gain insights on other economies like Malaysia or Vietnam. Armed with such knowledge that may not necessarily be emphasized in schools, students have an edge over their peers who are not exposed to such economic realities. Students then have a deeper understanding of how economics is like in real life. Economics is happening in real time as the students prepare for their exams, and they have to use this to their advantage, translating such knowledge to perceptive arguments in their answers. This makes their essays insightful, impressive and thus superior to others. Excelling in anything requires one to first find the right tools. To help students, many tools are available at JC Economics Education Centre. Firstly, students who wish to do extra practice to sharpen their skills are often discouraged from doing so as their teachers may be too busy to mark extra work. However, extra practice is almost always required, and if they do not receive comments, any work is futile as they will not know how to improve. Thus, Mr Anthony Fok takes the time and effort to mark through the work submitted by his students, providing comments so that the student can proceed from their and constantly refine their skills with each practice they undertake.Secondly, students may face obstacles while studying independently, outside of tuition. They may be confused by a concept and this slows down their revision as they are unable to continue without getting the concept right first. Worst, they may ‘move on’ without proper understanding, making for a shaky conceptual foundation. Thus, Mr Anthony Fok is available via text messaging, providing timely help for students who urgently require conceptual explanation. Time is a premium as students struggle to complete their revision before the examination. In order to succeed, students need to use their time wisely, making every second count. JC Economics Education Centre will be here to help students go “full-speed” by offering students targeted model essays and comprehensive, succinct notes. Students are thus able to maximize their revision time, covering as much base in as little time as possible. Intensive revision classes are also provided during the holidays and right before the actual A Levels, so that students can catch up on their learning, and ensure that they are in top form right. This also helps students build up the momentum as they prepare for the examinations, and gives them the assurance they need that they are indeed fully prepared for the actual examination. Master of Education (Leadership, Policy and Change) from Monash University, Australia. Tuition fees should be paid in advance each month, preferably on the first tuition day. You can make your payment either in cash or cheque payable to "JC Economics Education Centre Pte Ltd ". An official receipt will be given upon payment. Will refunds be offered if students fail to make it for a particular lesson? Refund of fees when a student is absent due to illness, vacation, holidays, or attendance at school activity. However, students can check with the tutor whether he or she can attend a make up lesson, one within the same week based on that week’s tuition schedule. Are there any other extra charges/fees? Other than the monthly fees, a one-time payment of $100 material fee will be required, used to print the year’s learning resources (handouts, worksheets, notes, etc.). Is there only 1 Economics tutor at JCEconomics.com? Yes. Mr Anthony Fok is the only tutor teaching all the lessons to ensure that lessons are of quality, that they adhered to his standards. Is it possible for students to join at any point in the school year? The ultimate goal of economics tuition at JC Economics Education Centre is to help students attain the A grade at the A Levels. Mr Anthony Fok is the most highly sought-after Economics tutor in Singapore, and it comes down to his experience, effective teaching methodology and endearing personality. He is not only a mentor, but also a friend to his students. What is the point of Economics tuition? Economics tuition is suitable for students who wish to consolidate their learning, go beyond the school’s teaching to gain an edge over their peers or to ask questions when in doubt – all required to attain an A. Students may struggle because they have never taken such a subject before and thus are not familiar with the requirements to do well. Tuition helps to prepare them in various ways, so that they can be confident of doing well in examinations.